Eidos Interactive, one of the world�s leading publishers and developers of entertainment software, today confirms that Battlestations: Midway will be released on Xbox 360 and PC in autumn 2006. Taking advantage of Microsoft�s next-generation video game and entertainment system, Battlestations: Midway on Xbox 360 delivers a genuinely new and exciting single and multiplayer gameplay experience. Battlestations: Midway follows the story of naval recruit Henry Walker, whose first assignment as a gunner at Pearl Harbor is the starting point of an incredible career at the heart of the US Pacific Fleet in 1942, in what was to become one of the most inspirational military campaigns in history. For the first time, relive the intensity of massive air, sea and underwater WWII battles in a unique mix of intense action and tactical gameplay. Directly control dozens of highly detailed warships, aircraft and submarines in a �free-control� environment as you design and execute the best plans of attack. 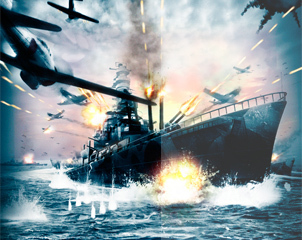 Command the colossal firepower of a fully armed battleship, engage the enemy in fierce dogfights through flak-infested skies or utilise the stealth of your submarine to unleash deadly torpedo attacks on unsuspecting enemies.